Discussion in 'Acquistion Targets' started by dandannoodles, Oct 16, 2011. Capitaland — A deeper correction to 3.11 is not impossible if the key support @ 3.40 is broken convincingly. 1. High volume is bearish when the stock is in distributing mode. 2. High volume is bullish when the stock is in accumulating mode. Capitaland has corrected 0.63 (-15.6%) from high of 4.03 to low of 3.40 on 15 Mar 2013. Capitaland is also one of my favourite stocks. 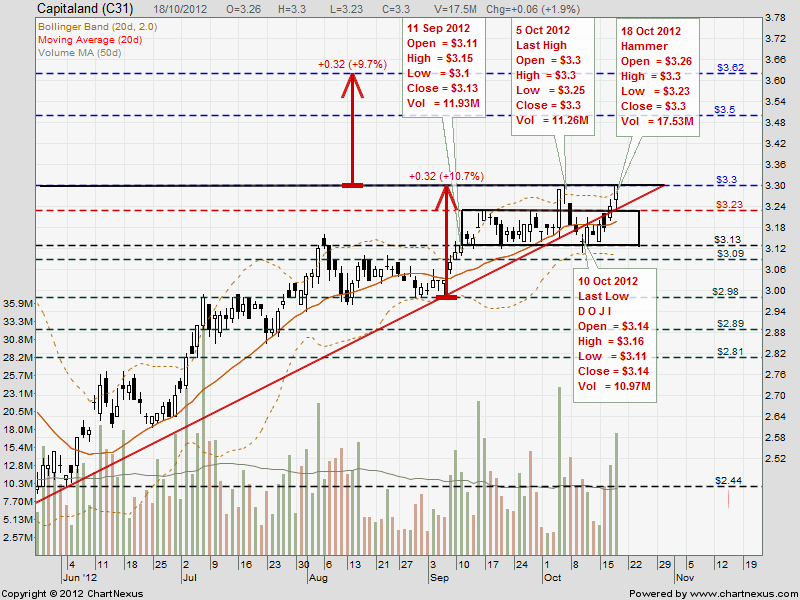 Crucial support S$3, the long term horizontal support. Income statement - Year on year Capitaland Ltd had net income fall 12.01% from 1.06bn to 930.35m despite a 9.33% increase in revenues from 3.02bn to 3.30bn. An increase in the selling, general and administrative costs as a percentage of sales from 16.22% to 17.58% was a component in the falling net income despite rising revenues. Growth rates - Year on year, growth in dividends per share increased 16.67% while earnings per share excluding extraordinary items fell by 10.98%. The positive trend in dividend payments is noteworthy since very few companies in the Construction Services industry pay a dividend. Additionally when measured on a five year annualized basis, dividend per share growth is in-line with the industry average relative to its peers, while earnings per share growth is below the industry average. Cash flow - In 2012, cash reserves at Capitaland Ltd fell by 761.38m. Cash Flow from Financing totalled 956.31m or 28.97% of revenues. In addition the company generated 249.30m in cash from operations while cash used for investing totalled 1.89bn. Balance sheet - Capitaland Ltd has a Debt to Total Capital ratio of 41.71%, a lower figure than the previous year's 81.43%. May 20 (Reurers) – Singapore’s CapitaLand Ltd, the biggest property developer in Southeast Asia, plans to raise up to US$520 million (RM1.57 billion) in convertible bonds due 2020, according to a term sheet of the deal seen today. The bonds were launched with a coupon of 1.375 per cent to 1.875 per cent and an initial conversion price of S$4.901 to S$5.0895, according to the term sheet. The offering would total up to S$650 million (RM1.57 billion), with an option to grow by an additional S$150 million. Capitaland closed with a black marubozu @ 3.47 (-0.06, -1.7%) on 23 Apr 2013. Immediate resistance @ 3.57, immediate support @ 3.41. Bro ZL, can post updated charts on Capland and Kepland when you have the time? Thanks in advance! Capitaland closed with a bearish dark cloud cover pattern @ 3.55 (-0.01, -0.3%) on 3 Apr 2013. Immediate resistance @ 3.60, immediate support @ 3.50. The last line of defense is @ 3.37, the 200d SMA. 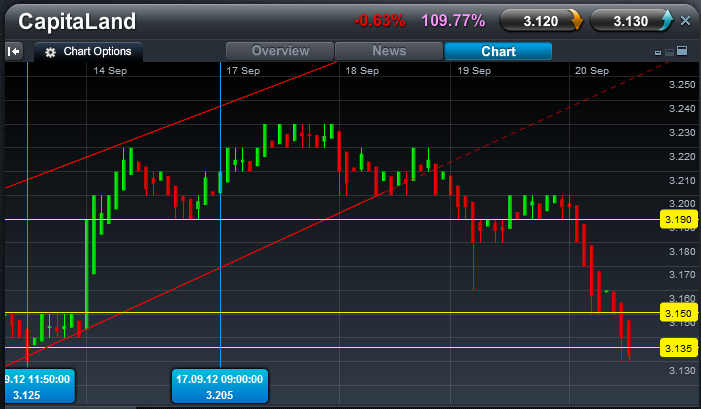 Strong support @ 3.11, the long-term horizontal support @ 3.00. To be honest, I am watching Da Bui Soh closely to see if the CKs will do what they did to Botak when it broke $20. If Da Bui Soh breaks and stay above $16 convincingly, the run up could be in the same magnitude as Botak. Another one I am keeping an eye on is Capland...prices seem to be stabilizing at 3.50 region and building a base. Can still go either ways of coz, up or down...still using vol as key supporting clue. UOB's Ascending Triangle Breakout reminds me of Capitaland when its long-term horizontal resistance-turned-support @ 3.11, last Sep 2012. Thank you Mika and Notti, Botak just hit $20.42. In contrast, DBS and OCBC pales in comparison - if the market makers were to sustain STI above 3300, i suspect they will have to push this two soon. Capland is near my shorting zone liao btw. 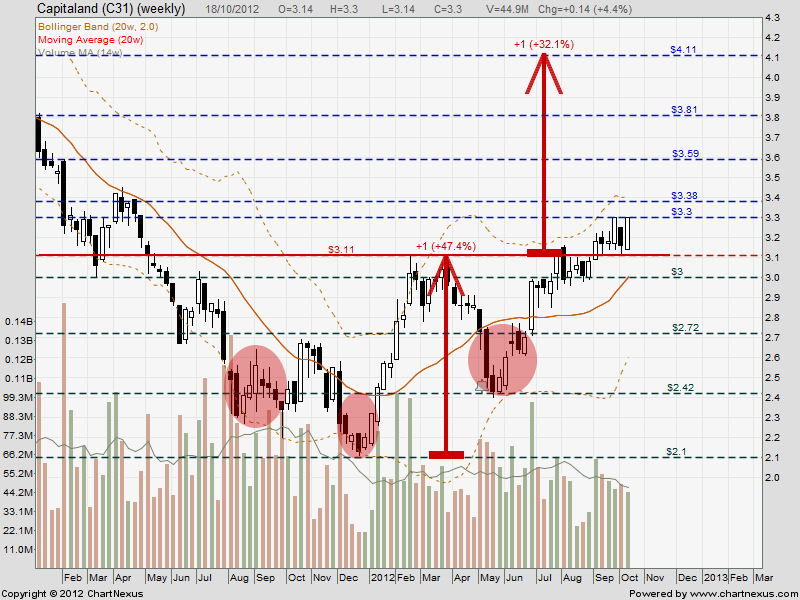 DBS's current price action reminds me of Capitaland when its critical support was @ 3.11, last Sep 2012. Capitaland closed with a black marubozu @ 3.13 (-0.06, -1.9%) on 20 Sep 2012. Immediate resistance 3.17, next resistance 3.23. Immediate support 3.09, the 20d SMA, next support 3.04, the 50d SMA. CapitaComm has corrected 0.135 (-8.1%) from high of 1.675 to low of 1.54 on 18 Mar 2013. The OBV remains relatively flat confirms that CapitaComm is on distribution mode since 30 Nov 2012 till todate. 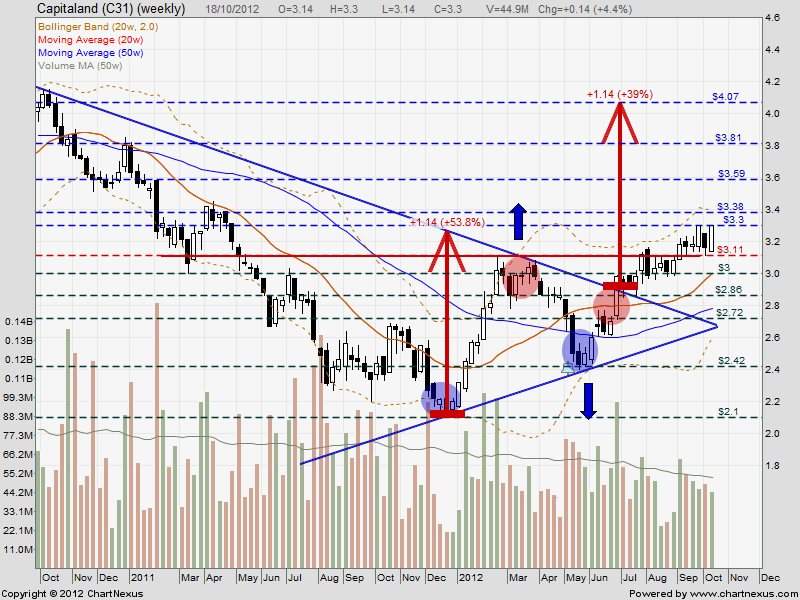 Capitaland closed with a bearish shooting star @ 3.51 (+0.01, +0.3%) on 22 Mar 2013. Strong support @ 3.11, the long-term horizontal support is @ 3.00. Capitaland closed with a white marubozu @ 3.53 (+0.02, +0.6%) on 20 Mar 2013. Immediate resistance @ 3.59, immediate support @ 3.40. Based on chart pattern, Capitaland's weekly chart is very bearish; strong support @ 3.11. Capitaland closed with a white marubozu @ 3.46 (+0.06, +1.8%) on 18 Mar 2013. Immediate resistance 3.50, immediate support 3.40. Capitaland closed with a white hammer @ 3.30 (+0.06, 1.9%) on 18 Oct 2012. Immediate support 3.23, immediate resistance 3.30, next resistance 3.45. Good Sunday and thanks Bro Zuolun for the charts! Bro Notti, i have some doubts abt the dividend play for the 3 banks having started...there are other counters in similar situation but kena whacked down. Capitaland closed with a black marubozu @ 3.40 (-0.15, -4.2%) on 15 Mar 2013. Immediate resistance 3.50, immediate support 3.33. CapitaComm — Bearish rounded top (inverted saucer) formation; expect more downside than upside. 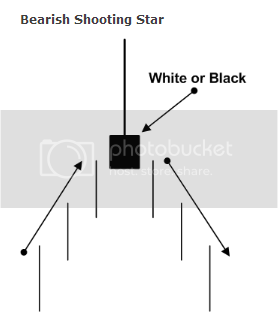 Wait for a decisive signal (preferably a long black marubozu) to SHORT, instead of LONG. Capitaland closed with a spinning top @ 3.59 (+0.01, +0.3%) on 13 Mar 2013. Immediate resistance 3.61, immediate support 3.53. Wait for U-TURN to LONG.